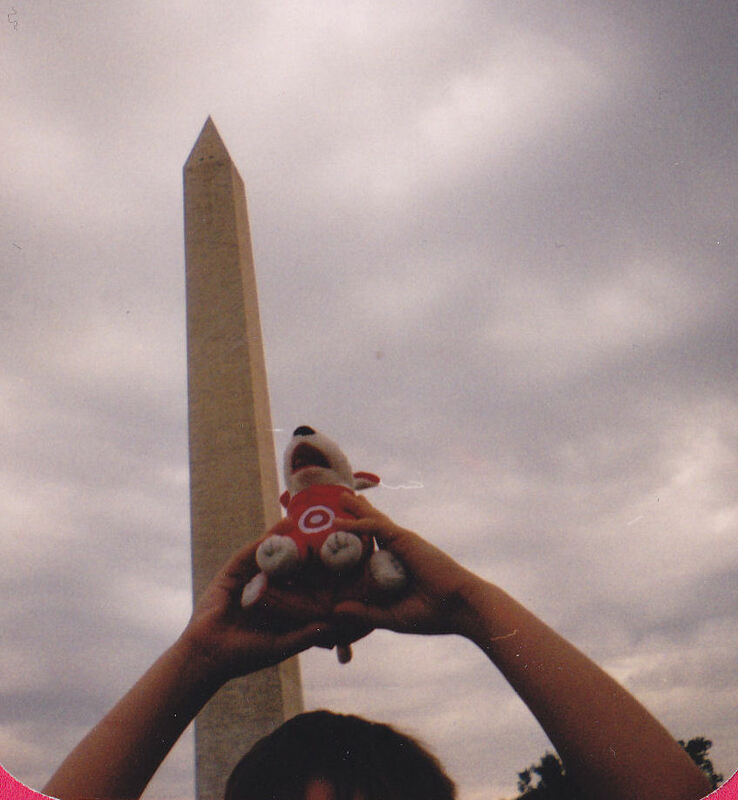 Our 2003 Road Trip, Part 2 of 7: Bullseye Goes to the Washington Monument « Midlife Crisis Crossover! The first of several photo ops with our very special guest star. And the boy. Previously on Midlife Crisis Crossover: our fifth annual road trip became our first family road trip as we jettisoned our convention plans and took my son to scenic Washington DC to learn history and significance and architecture and so forth. Day Three: Tuesday, July 8, 2003. Our first full day in the nation’s capital began with our first ride on a DC subway down to the Smithsonian station to start hitting the major attractions around the National Mall, the densest, most appealing area for tourist attractions and vintage buildings. Many of them were free. Not all of them were open. Several, including the National Archives and Ford’s Theater, were undergoing renovations or simply taking time off during the summer. Two years after 9/11, White House tours were out of the question unless you belonged to a scout troop or other organization of verifiable import. But we tried to make the most of those fabled institutions that rose to the top of our to-do list by dint of not being closed. 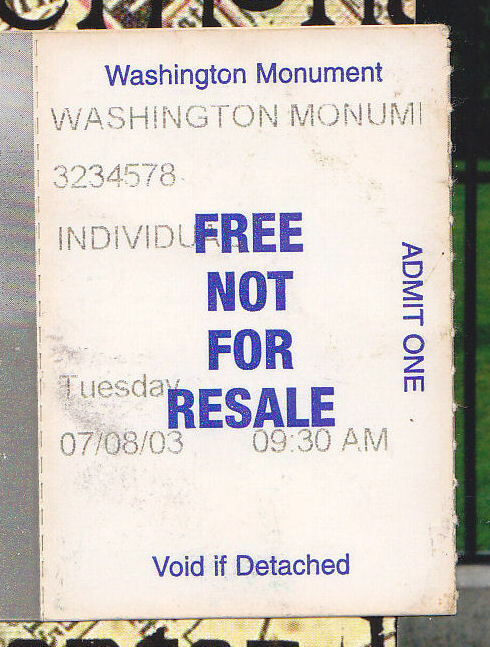 We walked over to the Washington Monument and picked up free tickets for the next available tour. Then we walked over to the Bureau of Printing and Engraving and did the same. A bit of wandering ensued to kill time till the monument was ready for us. In addition to the flag collection encircling the Monument, the Mall has a variety of notable statues and memorials scattered around the area. 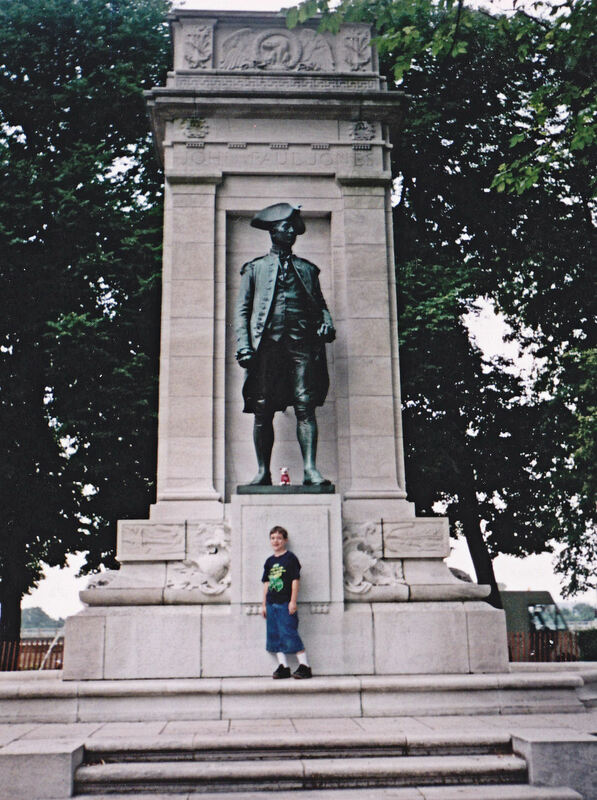 A 1912 statue honors US Navy hero John Paul Jones, the “I have not yet begun to fight!” guy from your American Revolution unit in history class. We saved most of our sculpture photography for Thursday and spent most of the time just turning around in circles and getting our bearings in this famous, faraway place. When you’re in DC, that sensation of “Wow, we’re really here!” can carry you for quite a while. We just needed it to last till our tour began. That critically acclaimed obelisk, unobstructed. Most of the tour was probably a history lesson you can replicate from Wikipedia if you can read it aloud to yourself with a proper docent voice. The trip brought us through a light security checkpoint (9/11: Never Forget) and onto an elevator that took us near the pinnacle some 500 feet upward. The top floor was somewhat cramped and claustrophobic but nonetheless equipped with a gift shop. The tour itself may be free, but maintenance and upkeep don’t pay for themselves. The occasional corporate sponsor doesn’t hurt. In an astounding coincidence, we brought our own matching accessory to their Special Thanks plaque. From there we hopped back to the Bureau of Printing and Engraving for a free tour of the place where American money is made. That sounded like a cool thing to see. The actual experience disproved our theory. We remember lots of machinery and talking about money, and…not much else. Earlier tonight I asked Anne if she remembered anything else about it. She started offering details but had to stop herself when we realized she was recalling our somewhat superior 2010 tour of the U.S. Mint in Philadelphia. The moral of the story: things containing the word “free” and “money” always have a catch, even when the words aren’t next to each other. Souvenir ticket #2. This is our only memento of the Bureau because no photos were allowed inside, as if we needed more reasons for disappointment. Most disappointing of all: lunch. 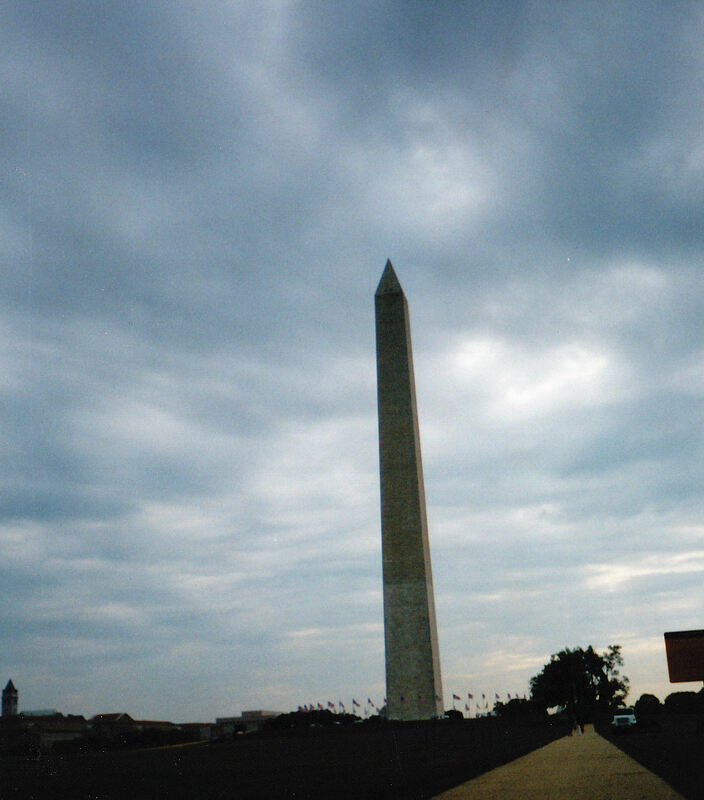 I can’t speak to today, but as of 2003 the National Mall was not covered in fast-food joints. In the middle of all those government offices, we civilians didn’t have many options out in the open. I hadn’t found anything nearby in my preliminary research, so I figured we’d wing it. I’ve lost count of the number of times those have been my famous last words. So lunch was at the first food-service place we came across: the cafe at the United States Holocaust Museum. We skipped the museum itself probably because we thought the subject matter might be too intense for my eight-year-old, but the cafe had a separate sign and entrance. Judging by the long line inside, we weren’t the only tourists desperate for nourishment and forced to rely on their limited selection of kosher foods, made even more limited by the fact that their kitchen staff couldn’t keep up with orders and appeared to be taking hours per customer. We were not excited. As former restaurant employees who have lived through this exact bad situation too many times on the other side of the counter, we knew our optimal survival strategy was to buy only those items already finished, on display, and ready for immediate purchase. That meant I got a basil, tomato, and mozzarella cheese sandwich and hoped my body was ready to compensate for this inadequate morsel by preparing to burn through my large supply of emergency fat cells. Anne, who can survive on far less sustenance and is a master of fasting, chose only a single apple, which turned out to be rotten inside. My son got a decent slice of cheese pizza and basically won the meal. To this day the Holocaust Memorial Museum Cafe remains, without hyperbole, the worst meal we’ve ever bought. Barely invigorated by a few extra calories, we proceeded onward to the Smithsonian area for better museum-based fun, pausing only for another photo with my son’s sidekick for the day. 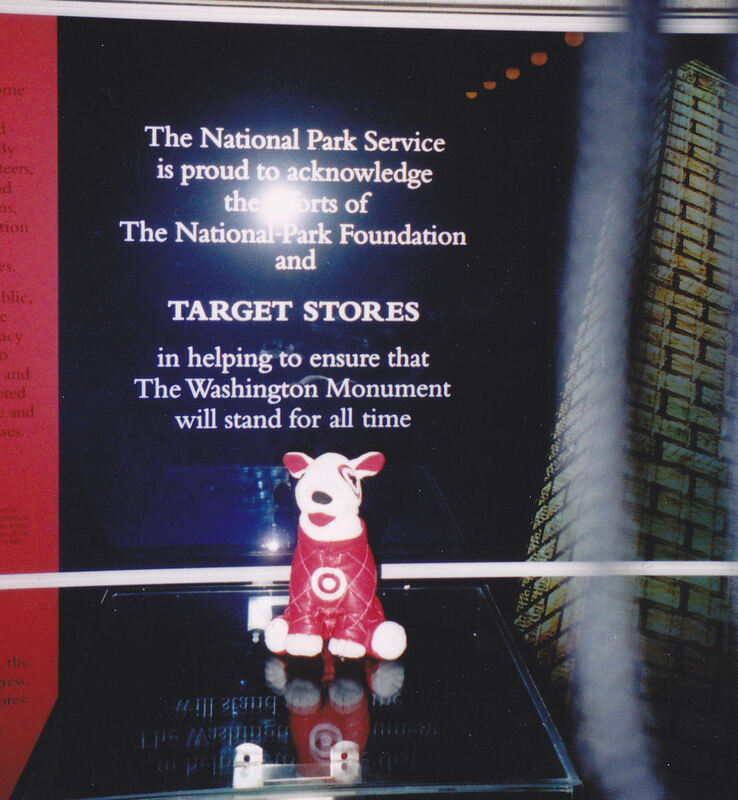 Of all the toys and stuffed animals he could’ve brought from home, he chose Bullseye the Target dog as his traveling companion, and insisted he should star in some of our photos. Today fun props are a common vacation trope for many internet travelers, but at the time I’m not sure if it was a wildly creative whim or just his version of a security blanket for his first big trip away from home with Dad and Anne. 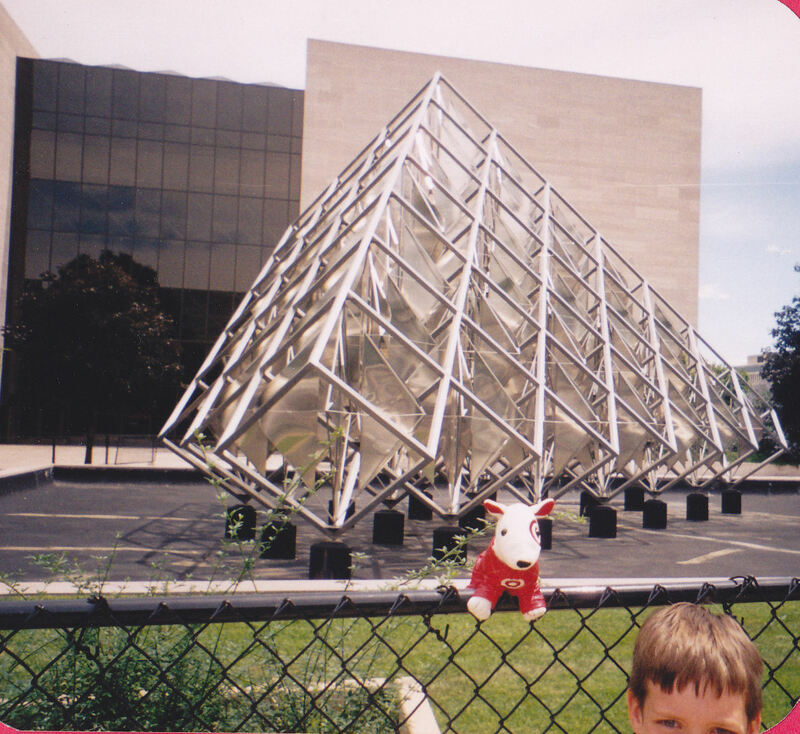 All we know is Bullseye helped make our 2003 photo collection cuter than the average travelog. We’ll remember Bullseye’s contributions to our experience far longer than we’ll remember…uh, whatever building that is in the background. The Museum of Secret Service Neckties or whatever.